Check out the cover of the new issue of Vanity Fair. And it’s the Hollywood Issue! Let’s discuss the Hollywood Issue before we go into Gwyneth. Because you know, they get criticised. They get sh-t on for diversity. And on the front page, we have Idris Elba, Chiwetel Ejiofor, Julia Roberts, and George Clooney. Open the flap and there’s Michael B Jordan, Lupita Nyong’o, Naomie Harris, and Chadwick Boseman. 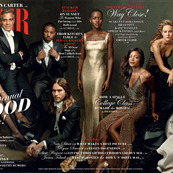 As my producer Michelle just said – doesn’t it look like Lupita’s won the Oscar already? OF COURSE Julia gets to be the only girl among the boys on the cover. OF COURSE she does. Could it possibly be any other way? Mind you, she’s also the only woman there who’s over 40. And so the long-awaited Gwyneth Paltrow piece will finally be made available…this time written by Graydon Carter himself. Word is they made peace. At this point then we shouldn’t be expecting anything too scandalous. Having said that, Graydon knows we’ve been expecting it. And longing for it. So, Graydon being Graydon, there has to be SOME snark, right? SOME? Because he knows he’d get sh-t on if he just put out a puff piece, right? How far will he go? A paper cut is still a cut, isn’t it?